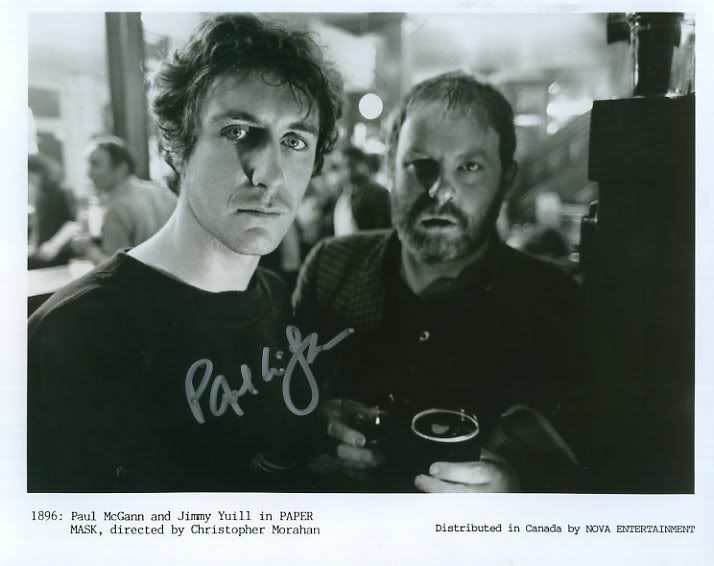 Thanks Estelle, I can see that Paul hasn´t changed his signature through all the years! I've heard good things about it, and I really need to see it! ... which goes without saying, I guess. I've tried to find Paper Mask but couldn't seem to find anything other than VHS - but I need to look again I'm sure. Isn't that Seduction of a Priest the one everyone was talking about over at Horatians as being so awful? I can't imagine it being so bad you wouldn't watch it - it's got Paul after all! I'd watch him sit and read the telephone book! The very same one Frigate and yes, it is that bad. I'm definitely in the horatian minority when I say I like this film ok and have even watched it a couple of times. However, it does scream for a Mystery Science Theater 3000 mocking (just for fun). Paul is quite ripped in this movie, but the tonsure just doesn't do him justice. Erm, it's just available on VHS. As I'm one of the last people on the planet to still have a working VHS player I guess I'll start looking in earnest for that now! Thanks for the info! I'll send them your way Frigate.